It’s been over 2 years since Milk.xyz was featured in our #WebsiteWednesday series, but they’ve been up to a lot of exciting things since then. We’ve been keeping an eye on them and all the exciting avenues they’ve excelled in, and we thought it was time for our #GenXYZ readers to get an up to date on Milk.xyz as well. So without further ado, we present the first #WebsiteWednesday check in on Milk.xyz. When we first introduced Milk.xyz to our readers, they had just rebranded from Mi.lk to Milk.xyz, and already boasted a strong readership for their content centered around music, streetwear, art, and culture. 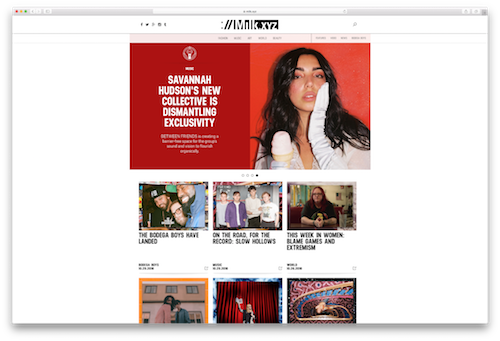 Now 2 years on, Milk.xyz has exploded into a multi-armed pop culture giant, expanding beyond simply reporting on fashion and music to rolling out collaborations with notable designers like The Arrivals and KidSuper. They’ve also expanded their media repertoire by welcoming two of the hottest comedians out there, Desus and Mero, A.K.A the Bodega Boys. Fresh off wrapping their hit show on Viceland, the dynamic duo have brought their superb podcast and loyal fanbase with them to their new home at Milk.xyz’s Milk studios, where they crack jokes about hip hop, celebrities, current events, and more alongside A-list starts like Jonah Hill. As the Bodega Boys would say, Milk.xyz’s brand is strong. Milk.xyz have taken their brand to stellar heights and have staked their place in the culture through hustle and creativity. Throughout Milk.xyz’s rise, their .xyz domain has played an integral role in helping them stand out from the crowd, just as your .xyz domain can help you amplify your voice and express your individuality online.